Paul McCartney says Beatles iTunes negotiations "stalled"
Waiting to download the Beatles' back catalog onto your iPod? You're going to have to wait a while longer, according to Sir Paul McCartney. 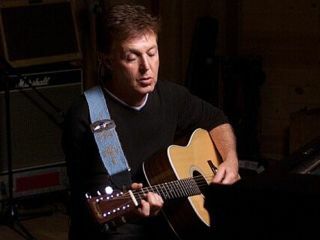 "We are very for it, we've been pushing it," said McCartney at a press conference today (24 November). "But there are a couple of sticking points, I understand. So the last word I got back was that it had stalled, the whole process." According to McCartney, Apple Corps and the band's label EMI couldn't agree on terms to release the Beatles' catalog to iTunes and other download services. "What happens is, when something's as big as The Beatles, it's heavy negotiations." Summing up the situation, McCartney said, "They [EMI] want something we're not prepared to give them. Hey, sounds like the music business. It's between EMI and The Beatles. What else is new?" McCartney was speaking at the Waterloo Pub in Waterloo, South London, to launch the album Electric Arguments. It's his third collaboration with musician/producer Youth under the alias The Fireman. Oh, and in case you were wondering, The Fireman is available on iTunes.